Maintaining your bean bag in its original state will ensure you get many years of use from it. Outdoor Bean bags are especially susceptible to damage while being exposed to the sun’s ultra-violet rays and pollutants in the air. Here are five valuable tips on how to keep your bean bag looking new. In recent years, bean bags have been manufactured using a wide variety of materials. These may include cotton, canvas, faux fur, nylon and polyester. Nylon and polyester are the most frequently used materials in outdoor bean bags. Just like any piece of furniture you will get a longer life cycle if your property is correctly maintained. Your bean bag travelled a long way to get to you. It was probably in a box with a heap of other bean bags, perhaps being crushed under the weight! And it was folded so it would be transported easily. So the chances are, when you received it, the bean bag cover was creased. While most of the creases will vanish over time, you can use a steamer to iron them out. The same steamer that you use to remove creases from your clothes will work just as well on your new bean bag. You may even get similar results using a steam iron, but be careful not to burn or melt the fabric. Removing creases will make your bean bag lounge chairs look even better. Leaving the product in the sun for a few days will also help to remove any creases in the fabric! The air we breathe contains a large number of pollutants. These pollutants include chemicals that will etch into the fabric and eventually damage the surface of your new bean bag. It is a good idea to clean regularly your product. When not in use, consider placing a sheet or dust cover over your bean bag, so that dust and dirt will not form on the surface. Regularly hosing off dust and dirt with fresh water will help to keep it clean. Accidents happen, and they often occur when you are eating and drinking. While the polyester used in our bean bags is resistant to stains and liquids, it is not bulletproof. You may spill red wine or tomato soup. If you do, visit some of the stain removal websites that can be found on the web. Immediately wipe off the stain with a damp sponge. Try using organic cleaner and be sure not to use any cleaning products that contain bleach. Soda Water and liquid detergent are useful products to soak out a heavy stain. 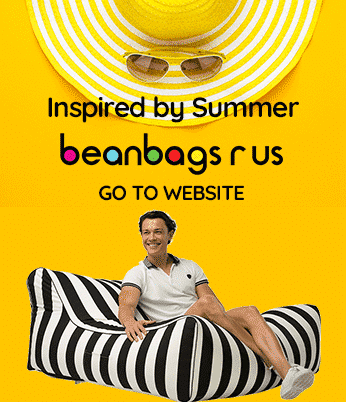 You may enjoy spending time in the sun, and your beanbag has been designed for outdoors. Our 1680D Polyester is specially treated to screen out harmful UV rays, so it is fade-resistant. However, prolonged exposure to direct sunlight will reduce the life of the product. When not in use, consider moving your bean bag out of the sun. If storing in a shed keep the beanbag dry and keep it away from vermin. A ‘Closet Camel’ or equivalent moisture absorption system will help to keep moisture out of storage rooms. Sweat also referred to as perspiration, contains salt, which is a natural acid. The salt in your sweat will stick to the surface of your bean bag, and it will eventually damage the cover if not regularly cleaned. Sweat also contains sugar, ammonia potassium and magnesium. Perspiration assists the excretion of toxins and waste products from your body. So, if you are sweating while sitting on your beanbag chair, be sure to wipe off any residue after use with a clean damp cloth and a mild detergent. Materials such as nylon and polyester are ideal for outdoor applications. Often these are coated with PU rubber of PVC, making them water resistant. Cheap bean bags will usually use fabric that has not been treated with UV retardant or mould retardant. So be sure if you are buying an outdoor bean bag that you buy from a reputable company that guarantees their fabric has been treated in this manner. Remember lighter colours will not fade as quickly as darker colours. And on a hot day be careful with dark coloured fabric as it will absorb the heat from the sun and may burn your skin when you first sit on it. We suggest that you use a towel to cover your bean bag when not in use. The towel will keep it cool and reduce chances of fading. How Does Chlorine Affect Fabric?